Baseball Coaching Tips for youth: This is youth ball not the pros. If I were giving coaching tips to youth baseball coaches I would make sure you know the difference between pro baseball and youth baseball. Is youth baseball coaching the same as pro ball? Well, yes and mostly no. Yes, many leadership qualities involve handling a group, positive modeling, and developing skills and character surely carry over. In reality, there are a few distinct differences coaching in the amateur youth levels compared to the major leagues. First, the major league players get paid. They get paid to produce. They have to help their team win or they will get replaced and eventually lose their jobs. Major League and managers also get paid. Compensation is contingent on how much their teams win and stay competitive. They play with a win-at-all-cost mentality. Yes, the big league coaches are great teachers, develop players, and know the game of baseball, but they have to do what it takes to win. Secondly, major league managers will make 'Big League Moves' matching up lefty and righty pitchers to face batters. Calling for strategies to bunt or to hit and run and placing pinch hitters into the games. 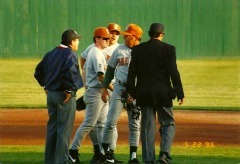 Often you will see MLB coaches arguing with umpires on close plays when they feel their player has been wronged. At times they will even lose their cool with the umps mostly because the need to win is so important to their profession. Partly, because it is part of the show. Thirdly, professional sports are entertainment for the fans. Major League players, coaches and managers are entertainers. They are putting on a quality show for a lot of people. Tickets are pricey because major leaguers are very good at what they do. My coaching tips would be to realize none of these items pertain to youth baseball coaching techniques. Therefore, there is a huge distinct difference in major league baseball and the youth baseball coaching tips & strategies and approaches. Many of our youth league coaches today are really confused on their roles. They feel like they have to bring all this intensity to the dugout or they are not looked at as fullfilling their duties or completing their percieved job. As a youth league baseball coach do you ever feel as though you are being judged on your ability to coach by your won-loss record? Do you ever feel like you should be yelling and scolding players on the field or you may be thought of as a poor coach? Have you ever been pressured to argue with umpires because the baseball parents push you into it? 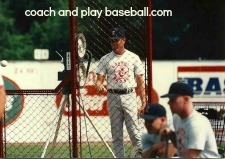 Do you ever feel like you are an entertainer or part of the 'show' while coaching on the ballfield? Have you ever seen really loud coaches and feel the parents think loud means you are a good coach? Have you ever over used your best pitchers because you put winning over the best interests of a players arm health? Wrestling with these questions is part of building your coaching philosophy and coaching approach. My player development system can walk you through steps to help answer these questions. Youth baseball is a universe away from major league ball. No one is going to lose their job for not winning the pennant. There is no entertainment involved really until we get to varsity high school, and college. Otherwise just parents, grandparents, other kin folk and a couple of dogs are watching. Quality youth coaches understand what they are and the role they play. They get it. They know that few players will even reach the high school level, much less college or pro. To deepen your understanding of my complete player development system for youth baseball take at look at my more detailed options. Thank you for stopping by coach and play baseball. I hope you will bookmark my site and stop back by. Please leave me a comment any time and let me know what topics you would like to hear more about.